-Is your sales & marketing engine tuned for highest performance? -Are your teams aligned and executing effectively? -Do we know when we’ve achieved success, and how to continuously improve? -Define typical points of failure and areas of focus for your teams. -Align your teams and message to the buyer journey to speed sales. -Gaining a common destination with measurable goals and metrics. Today’s customers expect vendors to immediately understand and address their individualized needs and pain points. Join this webinar to learn how to effectively incorporate highly personalized content into every engagement and how today’s most successful companies help guide their teams to victory. *Drive guided selling models for every buying cycle. To find out the state of sales enablement in 2016, look no further than CSO Insights' benchmark data on sales enablement optimization. This year's report reveals a picture of sales organizations in dire need of support, with only 56% of sales reps achieving or exceeding quota last year and an average ramp-up time of seven months or more. Long ramp up times, low quota attainment, & less time spent actively selling – all of these paint a picture of rapidly decreasing sales productivity. Sales is on the front lines every day trying to demonstrate the value of their product, service or solution. However, they are often plagued with too many tools and inefficient processes, which prevent them from doing what they do best – close deals. According to CSO Insights, sales reps spend only 35.9% of their time actively selling, and to further complicate matters over 82% of B2B decision makers think sales reps are under-prepared. Join us for a 10-minute webinar to learn how finance professionals can more easily use content to communicate unique value, strengthen branding and close sales deals. Hear how today’s top financial organizations use Showpad on iOS to realize the true power of their content while maintaining compliance. Join us for a 10-minute webinar to learn how manufacturing professionals can easily use content to communicate unique value, strengthen branding and close sales deals. Hear how today’s top manufacturing organizations improve processes, efficiency and productivity – and then measure and analyze all of it with Showpad on iOS. Join us for a 10-minute webinar to learn how hospitality professionals can easily use content to communicate unique value, strengthen branding and close sales deals. Hear how the world's largest developer of points-based vacation ownership uses Showpad on iOS to recruit and retain top talent, streamline onboarding, and measure and track all of it. Sales enablement has become one of the most critical arenas for success for modern med tech organizations, and has fundamentally redefined the way sales and marketing teams do their jobs. Join this webcast to see how a solid sales enablement strategy that is combined with the right technology can help your sales teams engage with providers more effectively. Do your sales reps waste hours preparing presentations? Are they constantly trying to pitch a complex solution in a very short amount of time? Are you flying blind as to which collateral works best with your providers? If you answered yes to any of these questions, this webinar is for you. How critical are in-person sales conversations? In this webinar panel featuring Showpad CEO, Louis Jonckheere, and Handshake CEO, Glen Coates, you'll learn how companies are transforming sales on the front-lines and empowering sales reps with mobile software to drive revenue. * Why in-person sales remains critical in a digital world. * How mobile software can add value to face-to-face sales conversations. * How Roland, a leading manufacturer & distributor of electronic musical instruments and equipment, is helping their sales reps be more effective at customer appointments. According to the latest CSO Insights research, companies with a sales enablement function in place outperform those that don't by 8.2% in higher revenues. However, today 75% of the firms surveyed don’t have this function in place, and the 25% that do could optimize their efforts even further. CSO Insights conducted a survey with 300+ companies in order to understand the role of sales enablement in helping organizations identify prospects and move them more effectively through the sales process to a close. Listen to Tamara Schenk, Research Director at CSO Insights, and discuss trends in sales enablement, a strategic initiative focused on optimizing sales process, resources and technology to better guide the buyer. Creating effective, sales driven content isn't easy. We're here to help you with some simple tips for creating, distributing and presenting showstopping content. Of course, truly effective content isn't just about the images or look and feel. You've got to have a powerful message that resonates and an effective solution to communicate that message to your prospects. Register to view the on-demand recording to learn about the 2 sides of effective content, creation and communication. Kathleen Smith, Director of Marketing from Visually, provided her unique perspective as a content creator and curator. Dena Nejad, Product Marketing Manager at Showpad, discussed the importance of a well thought out content management and distribution strategy. Thousands of forward-thinking organizations are leveraging modern sales enablement strategies and technologies to much success, and the time has never been more relevant than when the most important sales meeting of the year is upon us - Sales Kickoff. If 70% of material covered during training is lost within the first 24 hours, how can you ensure that the valuable information you are providing to your team is most effectively delivered, retained and reused with customers and prospects? The way people buy now has fundamentally changed forever. Strategies and tactics sales organizations have relied on for years no longer meet the needs of the marketplace. Everyone is looking for new ways to sell but many organizations are struggling to understand what “better” sales enablement really looks like. And yet, research powerhouse CSO Insight reported that organizations with a sales enablement function in place achieve 8.2% higher revenue than those without. Join this webinar to hear industry experts Thierry van Herwijnen, Host of Sales Enablement Labs, Kyle Parrish, VP Sales and Emma Dunnstone, VP Marketing at Showpad, dive deep into why a solid sales enablement strategy and supporting technology is crucial for a successful Sales Kickoff. How do you empower your mobile sales strategy with content? Our panel discusses ways to have better sales conversations by enabling your salespeople with dynamic content in the field. Learn how to tell more engaging stories centered around richer content types, more than just pdf's or office documents, but actually walking prospects through a dynamic story with HTML5, video, and content that's catered to your prospect's unique needs no matter the location. • How can marketing content accelerate sales? • How marketing can get feedback from sales to create better content? • Does sales have a responsibility to give content feedback to marketing? • How do sales people use content during the sales cycle? • How can marketing get insights on what content resonates with buyers? The changing dynamics of today’s selling environment requires sales and marketing teams to examine root causes of why they struggle to accelerate revenue and business growth. We’ve identified five pillars of sales driven marketing that will keep sales and marketing teams working better together. Face-to-face sellers (whether they work for your company or a distributor) are a critical component of the brand experience. When they engage with prospects, often in the later sales cycle stages, capturing metrics about their use of content is challenging if not impossible. Because content for sales enablement often falls outside of the marketing team, it's been ok to claim digital ignorance when there are no analytics to indicate how content impacted sales calls. Even if sales reps are adding notes to the CRM system, there is still no way to quantify results—but mobile is changing this. * accelerate revenue growth by enabling your sales team with the right content on any device. Join our session to find out how this key area of content development is changing and just what may be at risk. 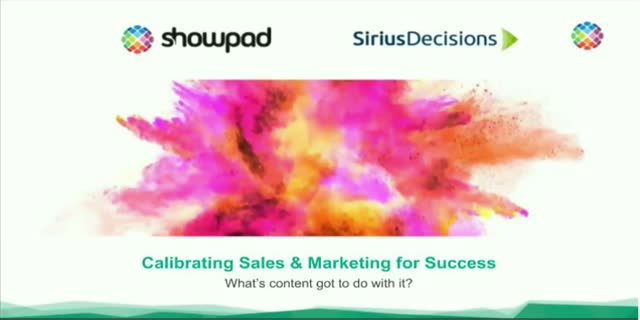 Showpad delivers the world’s most intuitive sales enablement software, one that increases the effectiveness of your content by making it incredibly easy to find, present, share, and measure. Our platform enables organizations to equip their customers, partners, and sales reps with the right content at the right time, anywhere and from any device. Unlike traditional file sharing or content management systems, Showpad is the only platform that allows you to effortlessly present and distribute your content in a branded environment to all channels, over the cloud, and easily measure its impact on the business. With Showpad, sales and marketing teams work better together to advance conversations, inspire loyalty, and accelerate your business. Deploy Showpad quickly, and scale as your company and content grow.